I was fine being asked to play the part of the brave older sister — until our family doctor took out a needle and dipped it into a vial of vaccine. I began to panic. “Be brave, be brave,” I told myself. And then … I passed out. And Lizz took off running. Sadly, this needle phobia has persisted my whole life. I am well aware that shots don’t actually hurt that much and that even giving blood isn’t so bad — consciously, I know this. And yet just thinking about it gives me the sickest feeling — all of a sudden, my breath just doesn’t feel sufficient to bring in oxygen. It’s a primal reaction I have no control over. Mark Kendall: Demo: A needle-free vaccine patch that's safer and way cheaper The fear of needles, of course, is very common. And as Mark Kendall points out in today’s talk: why are we still using the same technology to deliver vaccinations as we did back in 1853? Kendall’s innovation — the Nanopatch — delivers vaccinations through a tiny patch that’s smaller than a postage stamp. In research on animals, the Nanopatch does this more effectively than a needle, by targeting medicine to the cells under the outer layer of the skin. 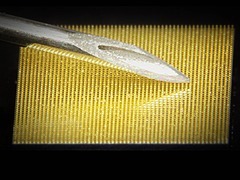 But, interestingly, the fact that the Nanopatch could do away with needle phobia is actually the least of its advantages. Watch Kendall’s talk for a look at how the Nanopatch could make the delivery of vaccines to areas where they’re needed most far easier than it is now. And how the Nanopatch could help scientists to create vaccines for diseases that don’t currently have them. Kendall — a professor at the University of Queensland Australia — isn’t the only researcher trying to do away with needles. Here, a look at other initiatives to move beyond the needle and syringe. In 2012, Jack You of Seoul National University unveiled a device that delivers drugs through a laser pulse. The pulse lasts 250 millionths of a second and, through a series of reactions described on Phys.org, creates a narrow jet of medicine that is just larger than the width of a human hair. “The impacting jet pressure is higher than the skin tensile strength and thus causes the jet to smoothly penetrate into the targeted depth underneath the skin,” explains Yoh. This device is intended to get medicine to the epidermal level. People with type 1 diabetes have to give themselves a lot of shots, and there has long been a desire to create an inhalable form of insulin for them. Exubera was the first to hit the market in the United States in 2006 — however, its high cost and oversized inhaler led to poor sales and it was soon discontinued. But the quest for a viable product continues, according to this Forbes magazine story from August. Mannkind Corporation has an inhalable insulin, Afrezza, that has completed phase 3 clinical trials with impressive results. The company calls its inhaler “the Dreamboat” because it is so small, though this insulin is still awaiting FDA approval. Good news for people with severe allergies who are being treated with regular shots. In December, the FDA approved two pills that dissolve under the tongue — Oralair and Grastek — both of which have been in use in Europe for a few years. According to NBC News, these treatments work by, essentially, training the immune system not to react to specific allergens. Paula Wolfson of WTOP notes that these pills are effective for allergens like pollen, dust mites, cat dander and grass, and wonders: could similar treatments eventually be developed for food allergies? Other researches are, like Kendall, exploring the potential of patches for delivering medications and vaccines. In this article from 2012, the National Institute of Allergy and Infectious Diseases wrote about a transdermal patch that delivers the flu vaccine. So far, this patch — developed by scientists at the Georgia Institute of Technology and Emory University — was shown to be effective in mice. In fact, the mice that received flu vaccine through the patch were better protected against the flu virus than those who received it through a needle. Four days after exposure, the patch-vaccinated mice were 1000 times more efficient at clearing the flu virus from their lungs. And the vaccination’s efficacy was still far better at the four week point, too. Now share: are you scared of needles? Does any of these treatments sound appealing to you? Check out Echo Therapeutics. They have a needle free, transdermal CGM monitor to check blood glucose. They also have a Prelude device that painlessly removes the outer layer of skin so they can give medication without a needle. Pretty cool stuff for those of us who hate needles! These new innovations, specifically the patch, combined with E-prescription through EHR’s and patient/member portals would allow for lower healthcare costs, as an office visit wouldn’t be necessary in some of these cases, while also allowing for a more timely delivery of medication (as many times office visits are days to weeks to months out for a simple injection, something that needs to be done by a healthcare professional in a healthcare environment). Further rural physicians could manage a higher patient load due to this, possible, virtual administration of medication. Bravo! I have needle phobia too. It’ll be cool to have treatment without needles. There is also the microneedle (or intradermal) approach used in some vaccines such as the flu vaccine Intanza by Sanofi. In this case, the needle is extremely short and merely pierces the skin rather than being inserted into the muscle. When handled properly (always important), it is said to cause much less or no pain at all.